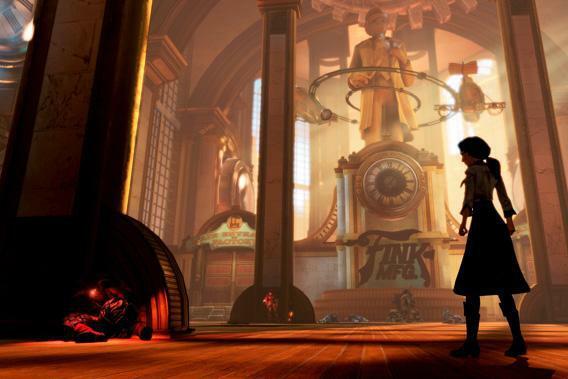 BioShock Infinite review: Ken Levine’s game raises fascinating philosophical questions. Its answer to every one: more shooting. BioShock Infinite wants to be deep and philosophical, but it’s just one big hail of bullets. Screenshot courtesy of Take-Two Interactive Software, Inc.
Video games are called revolutionary so frequently it’s easy to forget what the word means. Irrational Games, founded and led by Ken Levine, has become one of the most admired studios in the world, creating games like the newly released BioShock Infinite that both depict revolutionary events and are thought of as revolutionary for their embrace of history and philosophy where other games settle for hedgehogs and race cars. When viewed as philosophic works, however, Irrational’s games are distinctly anti-revolutionary. For Levine, all ideologies are bankrupt when their adherents become violent in defense of them, and the player is just trying to survive long enough to reach the escape hatch. This outlook enables an anti-revolutionary quality in game design as well, one committed to the status quo of having fun by shooting at people, something that’s at odds with the games’ supposed philosophic backdrops. BioShock Infinite is the latest in Irrational’s series of Shock titles, a shooting game in which players use a variety of guns and magical powers to fight two ideological factions warring over a dream city in the sky called Columbia. Into this city comes Booker DeWitt, a former Pinkerton agent and soldier haunted by his role in the ethnic slaughter at the Battle of Wounded Knee (and if you’re sensitive to spoilers, please proceed with caution). DeWitt, a hard drinker with an inescapable mountain of debt, gets hired by a mysterious man to sneak into Columbia and free a hostage named Elizabeth, a young woman with supernatural powers. Their escape triggers a revolution, with the exploited working-class populists, the Vox Populi, taking up arms against the city’s aristocracy, The Founders, a group of evangelical originalists who hoard the city’s wealth and tell exceptionalist tales of white supremacy. The game is sumptuous in detail and scope, a spectacular cross between The Wizard of Oz and The Terminator. The opening hour in Columbia is an extravaganza of set dressing and learning through exploration. But those qualities are soon set aside in favor of a smoldering and sour misanthropy. That tonal shift is necessary to rationalize the introduction of shooting-for-fun in such a rich exploratory environment—an approach that, in game design terms, is stubbornly conservative. The Vox Populi don’t have a revolutionary idea for how Columbia might be changed, it turns out. They just want to steal power from The Founders while exacting joyful and merciless revenge on the white bourgeoisie who’ve made them suffer. It doesn’t take long for Daisy Fitzroy, the Vox Populi’s charismatic leader, to devolve into a demented psychopath who’s willing to cross all moral thresholds in pursuit of victory. When the Vox Populi turn on DeWitt and begin attacking him alongside The Founders, there is no one left to root for. Everyone is a villain, in large part because the main thing the game wants you to do is shoot. You can shoot in a lot of different ways: with magic, with guns, when riding around on a roller-coaster-like sky rail system, or while taking advantage of the various support items Elizabeth’s powers can magically warp into the battlefield. And since everyone is shooting at you, you’ve got no choice but to start shooting back. This mistrust is perceptible in many of Levine’s games, and since everyone’s fair game for vilification, it makes it easier for him to justify a shoot-everything approach. System Shock 2, the outer space precursor to BioShock, follows a hero waking in a space station where all the humans have been zombified by an evil computer AI that’s hoping to wipe out human resistance to its plans to merge reality with cyberspace. Though less directly political, it poses a similar philosophical conflict between the body politic, always susceptible to becoming a brainwashed horde, and the evilness of their ruler. Freedom Force, released in 2002, similarly makes fighting the easily chosen imperative. That game, a cheerfully pulpy riff on World War II-era comic books, focuses on a compound that transforms otherwise normal people into either heroes or supervillains, impelled by their new powers to fight one another. As games have been drawn toward more explicitly philosophic reference material, they have tried to make do with classic gameplay concepts. In changing the frame of reference from deviant computer intelligences or comic book heroes to evangelical racism and labor organizers, Levine’s mistrust of extremism begins to feel like sleight of hand. It’s fair to wonder if Levine creates moral equivalence between an oppressor and his victims as a sneaky way to fall back on the same old shoot-‘em-up model, covering over any inconsistencies with spectacle and production value. It would be possible to make a shooting game tied to the point of view of one side in a conflict, but Levine’s expectation that extreme commitment necessarily leads to corruption makes this structure impossible. His stories don’t commit to sides—they mistrust all parties, something that’s easiest to express by having everyone eventually turn on the protagonist. It’s hard to think of another example where the ruling power and revolutionaries are as interchangeably evil as they are in Levine’s work. There is an overabundance of revolutions where the struggle produces horrific acts of violence, from the Maoist attempts to overthrow the Nepalese monarchy to the ongoing civil war in Syria. Yet these instances also show the disproportionate pressure placed on the revolutionary cause that makes an individual moment of violent resistance a sin, while systemic violence of a ruling power is tolerable. It could be said the American colonists were being irrationally violent by refusing to pay taxes to the British and violently destroying property in protest, or that John Brown’s violent slave rebellions crossed a moral line. Both statements are true, but it ducks the more difficult question of whether violence is a necessary catalyst that cannot be done without. The question of when and how violence might be justifiable is not easy to answer, but it’s one that deserves better treatment than to throw up one’s hands and say that both sides are bad. Infinite uses philosophy as a set dressing, but it’s unwilling to abandon fun-centric gunplay in favor of deeper philosophic engagement. There are a number of games that merge the mechanics of gunplay with the moral gray zones of violent conflict. Wolfire’s Receiver is a first-person exploration game where players wrestle with overwhelmingly complicated gun mechanics that require one to toggle the safety, manually load bullets into a revolver’s chamber, then empty the casings after firing. The added detail slows the pace of the game dramatically, but this complements the mysterious atmosphere in a way that could have been extraordinarily powerful in a setting like Infinite’s. Cart Life, which was just awarded the Grand Prize at the Independent Games Festival, is another painstakingly detailed account of the grueling life choices faced by the working poor, asking players to micromanage a food cart operator’s daily economy, from buying subway fare to setting kebab prices, and debating whether to splurge on a cigarette at the end of the day. Papers, Please puts players in the position of a border-control agent evaluating visas and passports of an array of different immigrants, from potential criminals to war refugees with obviously forged documents, and asks them to balance the morality of risking their own livelihood to help someone who might need it. BioShock Infinite references many of these same ideas in its setting and characterization, but they are incompatible with the gameplay’s guns, magic, and roller coastering. It’s not a revolutionary game but a monstrous one, marvelously alive but wrong-feeling. Ken Levine has created a world where the rational and emotional merge into fantasies so vivid and strange they have to be disbelieved. It’s a wonderful spectacle in the moment, full of floating cities, 19th-century labor politics, dimension hopping, and a giant robotic bird. It all quickly falls apart, though—a dreamy spasm of ego, paranoia, and emotional manipulation. The heart of all revolutionary causes is a belief that people deserve salvation from their present conditions. The anti-revolutionary mind is not opposed to salvation but simply believes it is impossible. (Think about this in context of the game’s ending revelations, when you get there.) “Some men crave money, some men crave love. My father craves a flood of fire,” Elizabeth says to DeWitt on the road to the climax, something it seems everyone in Columbia craves. “Why do we deserve salvation?” By Infinite’s end, Levine’s answer seems clear: We don’t.